The domain within your query sequence starts at position 30 and ends at position 193; the E-value for the MAM domain shown below is 1.61e-73. Likely to have an adhesive function. Mutations in the meprin MAM domain affect noncovalent associations within meprin oligomers. In receptor tyrosine phosphatase mu-like molecules the MAM domain is important for homophilic cell-cell interactions. MAM is an acronym derived from meprin, A-5 protein, and receptor protein-tyrosine phosphatase mu. The MAM domain consists of approximately 170 amino acids. It occurs in several cell surface proteins and is likely to have an adhesive function [(PUBMED:8387703)]. The domain has been shown to play a role in homodimerization of protein-tyrosine phosphatase mu [(PUBMED:7782276)] and appears to help determine the specificity of these interactions. It contains four conserved cysteines which probably form two disulfide bridges. It has been reported that certain cysteine mutations in the MAM domain of murine meprin A result in the formation of monomeric meprin, which has altered stability and activity [(PUBMED:8798668)]. This indicates that these domain-domain interactions are critical for structure and function of the enzyme. Proteins containing this domain are listed below. Meprin. 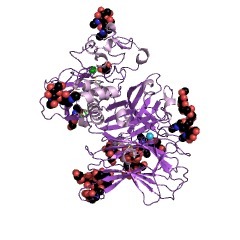 This cell surface glycoprotein contains a zinc-metalloprotease domain capable of degrading a variety of polypeptides. Meprin is composed of two structurally related subunits (alpha and beta) that form homo- or heterotetramers by the non-covalent association of two disulfide-linked dimers. In both subunits, the MAM domain is located after the catalytic domain. It has also been shown that the MAM domain of meprins is necessary for correct folding and transport through the secretory pathway [(PUBMED:9857066)]. 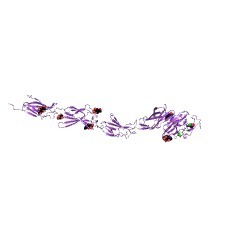 Neuropilin (A5 antigen), a calcium-independent cell adhesion molecule that function during the formation of certain neuronal circuits. The sequence contains 2 CUB domains and a MAM domain. 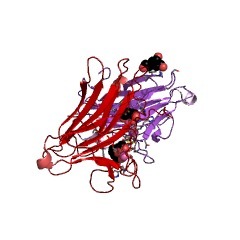 Receptor-like tyrosine protein phosphatases Mu, Kappa and PCP-2 (EC 3.1.3.48). These PTPases have an extracellular region which consists of a MAM domain followed by an Ig-like domain and four fibronectin-type III domains. Vertebrate enteropeptidase (EC 3.4.21.9), a type II membrane protein of the intestinal brush border, which activates trypsinogen. 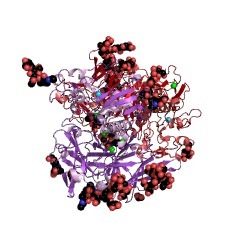 It consists at least of a catalytic light chain and a multidomain heavy chain which has 2 LDL receptor class A domains, a MAM domain, a SRCR domain and a CUB domain. Apical endosomal glycoprotein from rat, a protein probably involved in the sorting and selective transport of receptors and ligands across polarized epithelia. This protein contains 6 MAM domains. Xenopus laevis thyroid hormone induced protein B. This protein contains 4 MAM domains. Pig zonadhesin, a protein that binds in a species-specific manner to the zona pellucida of the egg. There are 13548 MAM domains in 5639 proteins in SMART's nrdb database. Taxonomic distribution of proteins containing MAM domain. This tree includes only several representative species. The complete taxonomic breakdown of all proteins with MAM domain is also avaliable. Click on the protein counts, or double click on taxonomic names to display all proteins containing MAM domain in the selected taxonomic class. Cysteine mutations in the MAM domain result in monomeric meprin and alter stability and activity of the proteinase. Meprins are oligomeric, glycosylated cell surface or secreted metalloendopeptidases that are composed of multidomain disulfide-linked subunits. To investigate whether subunit oligomerization is critical for intracellular transport or for the enzymatic and/or physical properties of the proteinase, specific cysteine residues were mutated, and the mutants were expressed in 293 cells. Mutation of mouse meprin alpha Cys-320 to Ala in the MAM domain (an extracellular domain found in meprin, A-5 protein, and receptor protein-tyrosine phosphatase mu) resulted in expression of a monomeric form of meprin, as determined by SDS-polyacrylamide gel electrophoresis and nondenaturing gel electrophoresis. The monomeric subunits were considerably more vulnerable to proteolytic degradation and heat inactivation in vitro compared with the oligomeric form of the enzyme. Proteolytic activity of the monomeric meprin using a bradykinin analog or aminobenzoyl-Ala-Ala-Phe-p-nitroanilide as substrate was similar to that of disulfide-linked oligomeric meprin; however, activity against azocasein was markedly decreased. Mutation of another cysteine residue in the MAM domain (C289A), predicted to be involved in intrasubunit disulfide bridging, resulted in disulfide-linked oligomers and monomers. 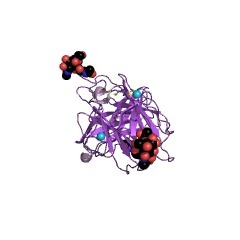 These results indicated that this mutant was capable of forming intersubunit disulfide bonds but less efficiently than wild-type meprin subunits. Mutant C289A also retained activity toward peptides but not the protein substrate and was more vulnerable to proteolytic degradation and heat inactivation compared with the wild-type enzyme. Both Cys mutants were expressed and secreted into the medium at levels comparable with the wild type and had slightly altered glycosylation. This work indicates that 1) Cys-320 of mouse meprin alpha is most likely responsible for the covalent interactions of the subunits; 2) covalent dimerization of subunits is not essential for efficient biosynthesis, trafficking, or posttranslational processing of the secreted protease; and 3) mutations in the MAM domain affect noncovalent interactions of the subunits and the stability and activity of the protease domain, indicating that domain-domain interactions are critical for structure and function of the enzyme. This information is based on mapping of SMART genomic protein database to KEGG orthologous groups. Percentage points are related to the number of proteins with MAM domain which could be assigned to a KEGG orthologous group, and not all proteins containing MAM domain. Please note that proteins can be included in multiple pathways, ie. the numbers above will not always add up to 100%.